Watchmen HBO Series In The Works | Nerd Much? According to Variety, Damon Lindelof is in talks with HBO to make a TV series based on the comic book, Watchmen. Lindelof is a writer known for his work on the TV show Lost and films Tomorrowland and Prometheus. 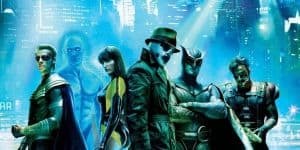 This isn’t the first time HBO has tried to convert Watchmen into a TV show, as back in 2014 an attempt was made before the project had to be scrapped. Apparently this renewal of the idea will not retain anything from the first attempt. Lindelof will be writing a completely independent script. The last time the Watchmen IP hit the big screen was in 2009, with a film from Warner Bros. Directed by Zack Snyder, the movie divided fans of the comic between either loving the movie, or hating it. There seemed to be no in between due to both the accuracy to the comic book and the inaccuracies. Most of the film was stunningly accurate, but the ending (a key element to the comic book) was altered quite a bit. That said, this HBO series will be entirely separate from the film, for better or worse. The message of Watchmen is quite a hefty one, and there are certainly many sides to the argument. It will be interesting to see how a TV series will be able to lay out such heavy philosophies and if they will keep Rorschach as the main character.